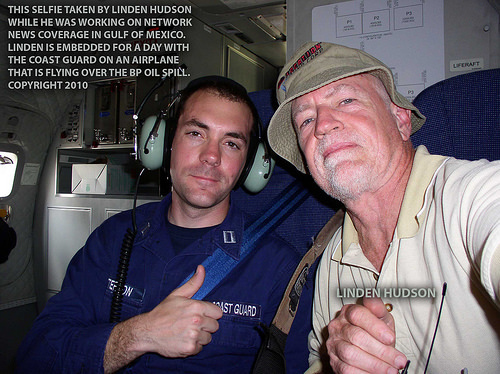 Selfie taken by Linden Hudson, while riding on Coast Guard plane. Linden was a sound engineer with a national tv network news crew for this story. This airplane made 7 or 8 low altitude (500 feet) flyovers of the exploded BP oil rig (Deepwater Horizon) during the taking of this photo. Those Coast Guard fellows are super nice.